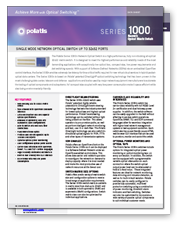 The Polatis Series 1000 Optical Switch is a high-performance, fully non-blocking all-optical 32x32 matrix switch. It is designed to meet the highest performance, security and reliability needs of mission-critical applications with exceptionally low optical loss, compact size, low power requirements and fast switching speeds. With support of Software-Defined Networks (SDNs) via an embedded OpenFlow control interface, the Series 1000 enables extremely low latency for time-critical traffic required for new virtual cloud services in hybrid packet-optical data centers. The Series 1000 is based on Polatis' patented DirectLight® optical switching technology that has been proven in the most challenging defense applications and is also field proven in a wide range of commercial applications by major network equipment manufacturers. Its' compact size coupled with very low power consumption make it space efficient and an ideal choice for mission-critical applications.